Home Blog What’s So Great About a Three-Way Adjustable Gantry Crane? What’s So Great About a Three-Way Adjustable Gantry Crane? Gantry Cranes are a popular choice for a variety of industries needing versatility, portability, and adjustability. They are one of the most popular overhead cranes on the market due to their affordability, but also because they are arguably one of the most flexible overhead crane systems on the market. There are a large variety of gantry cranes available, and all of them have their individual benefits. However, three-way adjustable gantry cranes are capable of multiple functions because of their stability and adjustability. Just like most gantry cranes, the three-way gantry sports a true A-frame gantry design and is portable, meaning it can reach all corners of your plant to lift and move materials. They are quickly disassembled for transport by service trucks, making them extremely useful for practically any application. But, the main function of a three-way adjustable gantry is its adjustable span, height, and tread. This type of control and flexibility allows workers to use them on uneven floors, along with easy passage through doorways, aisles, and under other overhead obstacles. Most three-way adjustable gantries come in either all steel or steel with an aluminum I-beam. Three-way adjustable gantries also provide extra stability because they are designed so that the I-beam is free to pivot as it self-centers over the load. Furthermore, the A-frame design helps to maintain greater stability, eliminating the swaying motion that can be common in other gantries. 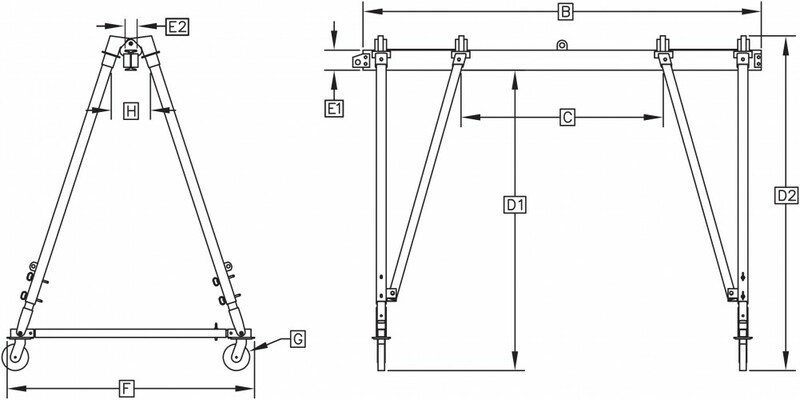 The adjustable span uses a lock design to securely hold the I-beam during adjustments and when set, while the height is adjustable in six-inch increments using push/pull pins on the main legs. The adjustable tread is designed using a cable assembly that is bolted inside the caster frame tubes to prevent overspreading. Three-way adjustable gantry cranes also deliver cantilever options—up to four feet (25 percent of the span) when using counterweights. If you’re in the market for an affordable, flexible, and highly efficient overhead crane with capacities up to 15 tons and spans up to 40 feet, there’s really nothing this crane can’t do.